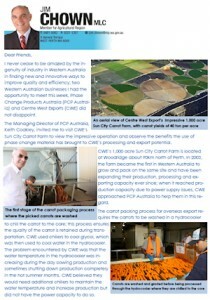 I never cease to be amazed by the ingenuity of industry in Western Australia in finding new and innovative ways to improve quality and efficiency; two Western Australian businesses I had the opportunity to meet this week, Phase Change Products Australia (PCP Australia)and Centre West exports (CWE) did not disappoint. The Managing Director of PCP Australia, Keith Coakley, invited me to visit CWE’s Sun City Carrot Farm to view the impressive operation. 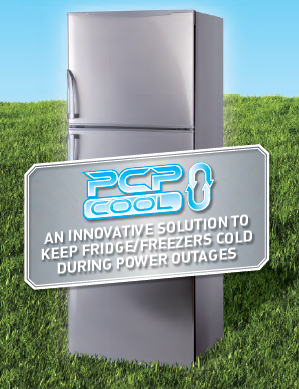 Just as sustainable building design has taken notice of phase-change materials, so too are industrial and manufacturing processes recognising the energy cost savings these systems offer. 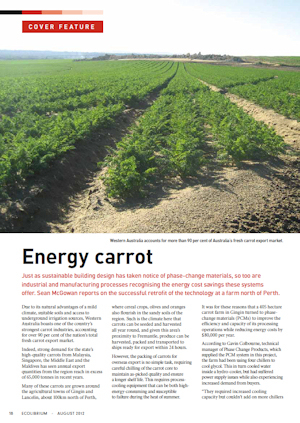 Sean McGowan reports on the successful retrofit of the technology at a farm north of Perth. Due to its natural advantages of a mild climate, suitable soils and access to underground irrigation sources, Western Australia boasts one of the country’s strongest carrot industries, accounting for over 90 per cent of the nation’s total fresh carrot export market.